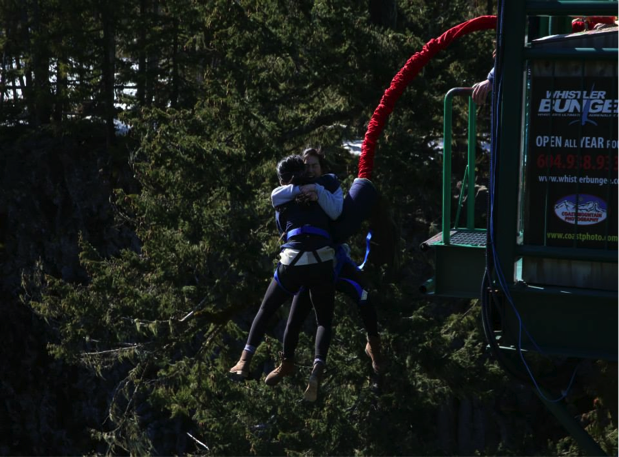 Le Physique | Vancouver Personal Training | Bungee jumping, anyone? His palms are sweaty, knees weak, arms are heavy, there’s vomit on his sweater already, mom’s spaghetti, He’s nervous, but on the surface he looks calm…. …Okay I’m no gangster rapper, but Eminem and I had something in common this marvellous sunny afternoon in Whistler. My heart pounding out my chest, sweaty palms, heavy breathing, light headed, and nauseous. Why did I want to do this again..? What was so appealing about jumping off a 150 foot bridge? I decided to take the plunge with Whistler Bungee because they have a perfect safety record, the most experienced workers, and hundreds of people doing it every day… But the only thoughts racing through my head were: the rope is going to snap in half and I am going to plummet to my death in the rocky abyss that lies below. All these thoughts were rushing through my mind uncontrollably. I could not help it, it’s human nature, it is our fight or flight response. And let me tell you I wanted to flee, but I chose to fight, I chose to go through with what I had signed up for. I was nervous for days before my big jump. It was something that had always been on my bucket list, but the more I thought about it the more nervous I became. All the anticipation and nervous excitement that had been haunting me for weeks accumulated into a sudden realization that today was the day I would become a certified adrenaline junkie. We met mid-afternoon in Whistler Village. I took comfort in the fact that I was not the only nervous one in the room, there were 7 jumpers including myself .We all laughed nervously, becoming more and more hysterical by the minute. We all piled in a van and embarked on a rocky voyage deep into the mysterious and foreboding Callaghan Valley. With ACDC’s “Dirty Deeds, Done Dirt Cheap” blasting in the background, I could literally feel my heart pumping out of my chest. Before I knew it the driver had announced, “look up at the bridge”. When I arrived at the bridge, my initial reaction was DOES IT REALLY HAVE TO BE NARROW AND SEE THROUGH? “BREATHE” I ordered myself, breathe! But I kept getting more light headed, hysterical and scared by the second. The only comforting thing now was the fact that I wasn’t jumping off alone; I would be jumping in tandem with my best friend. They buckled us up, tied us together and opened up the gate. Making our way to the edge I looked around me: trees, rocks, river, 150 feet high. Great. There is no going back now. I was there. So close. My heart was beating so fast, I wondered if I was about to have a heart attack or collapse. I had felt this way before, sure, before a big final exam worth 50% of my grade, an interview or a presentation. But take those nerves and multiply them by 1000. That is how it feels when you are about to jump off a 150 foot bridge. 5-4-3-2-1 it was too late I was falling, too shocked to scream, could not find my voice, my stomach in knots and before I knew it I was flying. Gravity making us accelerate faster and faster and with the backdrop of trees whizzing by us; a blur of green. We reached the bottom and I finally was able to let out a shriek of terror and excitement. 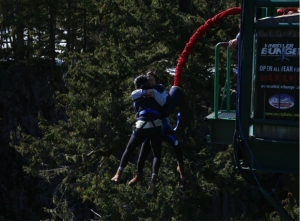 The bungee chord tethered to us yanked us back up abruptly and I felt my body being whiplashed back up towards the bridge. We bounced back up and down a few more times. Suspended mid-air, I finally regained my wits and was able to bring my awareness to the breathtaking beauty that surrounded me. Terror and fear had been replaced by a crazy adrenaline rush. I felt amazing! I felt indestructible, I felt brave, and most importantly I was alive and felt no pain! I wanted to do it again! I had always enjoyed roller coasters but this was a whole new high. My adrenaline was pumping for almost 24 hours. Needless to say I did not sleep that night, I was too awake, too shaken up. WHAT HAPPENED TO MY BODY AND WHY DID I FEEL THIS WAY? Why was my heart beating 5000 times faster than usual? Why was my breathing heavier? Why did my palms get sweaty? Why was I shaking and light headed? 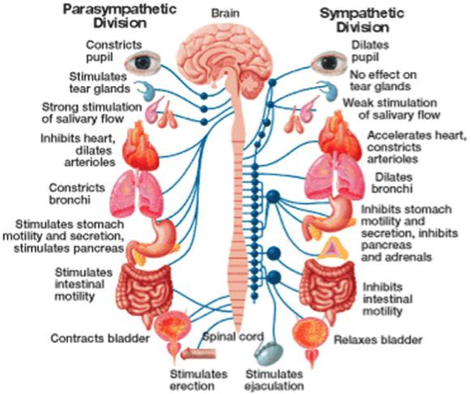 These are all symptoms of our bodies “Fight or Flight” system, otherwise known as our bodies response to stress. As I stared down into the 150 feet of empty space I was about to jump into, my brain said, WHAT THE HECK MELISSA, ARE YOU INSANE? Our brains are conditioned to recognize threats and responds by sending a signal via our sympathetic nervous system to our adrenal glands, located above our kidneys. As I stand anxiously awaiting my turn to jump, the “fear centre” in my brain or amygdala lights up. It sends a message to our brains “secretary” or hypothalamus which responds by directing our pituitary glands to release ACTH. 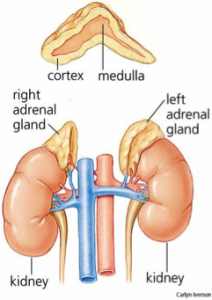 Almost instantly our adrenal glands will release neurotransmitters that will result in the secretion of the stress hormones, cortisol and adrenaline. The result includes, constricted blood vessels, dilated air passages, accelerated heart and inhibition of our digestive system and other “non-essential” bodily functions. To summarize, it is our body’s way of redirecting its resources to our vital organs. Since not all of us are crazy enough to jump off a bridge, there are many other activities that can elicit our fight of flight response. Think about that time you had an important interview, asked that cute girl/guy out on a date, gave your first speech or were playing in an important game. Your body automatically perceives the environmental stress and creates that familiar anxious state we all have experience from time to time. 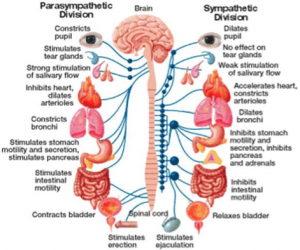 In fact our sympathetic nervous system’s response facilitates our survival. Our body releases adrenaline in potentially dangerous situations. Within seconds we gain a physical boost and we temporarily become HARDER, BETTER, FASTER, STRONGER (to quote the great Daft Punk). Our ability to sense pain diminishes and we become better equipped to take action. That euphoric, superhuman and indestructible feeling I had after jumping off the bridge was really just all the adrenaline pumping through my bloodstream. What follows an adrenaline rush? You guessed it…adrenaline crash. You know the dreadful feeling you get when your morning coffee begins to wear off? Well, the more adrenaline pumping through your system, the bigger the crash. My adrenaline rush lasted almost a full 24 hours. My whole body felt alert and I had a feeling that I could conquer the world. Although I felt amazing, prolonged states of arousal can cause a host of health issues including anxiety, decreased immune response, fatigue, chest pains and can worsen pre-existing conditions. Want to see a video of me bungee jumping? Now it’s YOUR turn – tell me…would you be crazy enough to do this? What would you do instead? 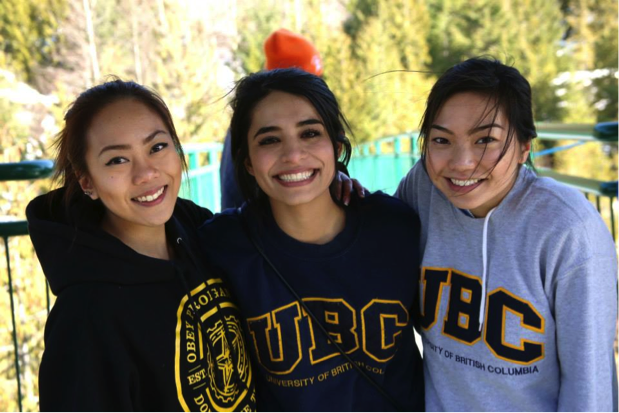 Content contributions are courtesy of our Kinesiologists, therapists and Co-Op students.